There are three types of tow trucks in the market that Fort Worth resident can choose to haul their vehicles. We recommend that you give Towing Fort Worth a call to ask about these types. One of our friendly customer service representatives will be happy to take your call and answer all your questions about the types of tow trucks that Towing Fort Worth keeps in its towing fleet. One of the types of tow trucks we use often is the flatbed tow truck. 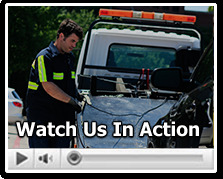 This is because flatbed tow trucks enable us to keep your vehicle from incurring dings, dents, and scratches. In fact, using a flatbed tow truck is really one of the safest, most effective means of towing your vehicle from one location to another. Each one of these types of tow trucks has the ability to load your entire vehicle onto its bed. This ensures that all four tires are off of the ground, and there is almost zero risk of wear and teat on your car, truck, or van. One of the other types of wreckers in the market is the Wheel-lift tow truck. This type uses a yolk that hooks under the rear or front wheels and lifts one end of the car off the ground. This can reduce damage to your vehicle, but it is not quite as risk free as using a flatbed tow truck. Finally, Fort Worth residents should be aware of the hook & chain type of tow truck. Some tow companies still use these as their main type of tow truck, but they really shouldn’t. These are an older type and are not used by tow companies like Towing Fort Worth except when towing vehicles away from the scene of an accident. This is because the towing process itself can cause dents, dings, and scratches when using a hook & chain tow truck! Thus, not only do we recommend calling a tow company to be sure of what type of wreckers are being used by that company, but we highly suggest asking for a flatbed tow if at all possible.